The birders were up and about early leaving the Madang Resort at dawn and drove approximately thirty minutes out of town to an area of forested ridges and lowland gardens. After being welcomed by our local guides, we followed a wide path into the secondary forest, seeing what hidden avian treasures we could uncover. Before too long, a careful scan of the ridges revealed perched Blyth's Hornbill and Sulphur-crested Cockatoo, while Brahminy and Black Kites cruised overhead. A Palm Cockatoo was seen all too briefly, but a pair of Rufous-bellied Kookaburras showed extremely well. We continued to a clearing that was surrounded by old trees and overlooked steep karst ridges that still held good forest. Here we added Pinon's Imperial Pigeon and Orange-bellied Fruit Dove, while a rare Lowland Peltops perched atop a snag. Yet the morning's highlight for many was a calling Lesser Bird-of-Paradise that flew in close. During our walk out we added Gray Crow, Golden Myna, Hooded Butcherbird, and the diminutive Red-capped Flowerpecker. A very brief stop along a bridge across the river added Common Greenshanks and fly over Helmeted "New Guinea" Friarbird. We also spent a bit of time birding the well-vegetated resort grounds adding the abundant Varied Honeyeater, many Singing Starlings, Torresian Imperial Pigeons, and a pair of Variable Goshawks that appeared to be nesting nearby. 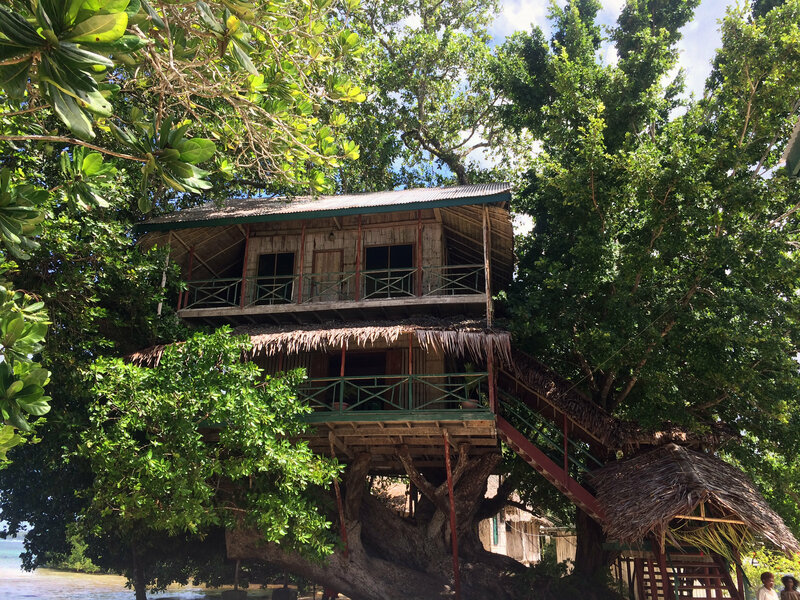 Earlier on in the day we had spent time exploring Madang and the scenic surrounds taking in the sights of the local museum and local villages. After lunch at the Madang Resort we were soon whisked onboard the Spirit of Enderby, our home for the next 12 nights for our journey through Melanesia. 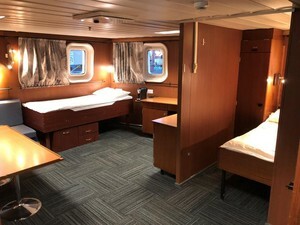 Once settled into our rooms we were ushered to the lecture room for an introduction to the ship, expedition staff plus a mandatory briefing on emergency procedure along with a practice run at the muster station. Up on deck we said our farewells to Madang and headed towards the Sepik River. 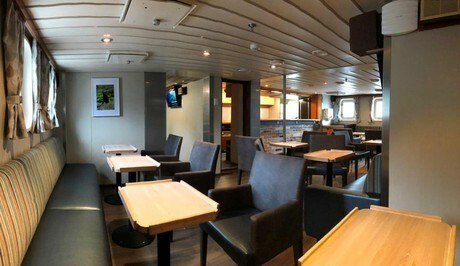 There was a festive atmosphere onboard as we met our new shipmates and the Heritage expedition team, during the welcome drinks at the bar followed by dinner in the Ice Culture restaurant. In true expedition style our start to the day was an early morning breakfast at 05:45, to ensure we could explore the mighty Sepik (Sea-pik) River via a Zodiac cruise at first light. The meandering Sepik, over 1,200km (700miles), is the longest river in Papua New Guinea and starts in the Victor Emmanuel ranges on the West Papuan border, to twist its way like a gigantic brown serpent towards the Bismarck Sea. Entering a small man-made channel, the banks lined with spiky sago palms caused our drivers to proceed with caution. Sago, the staple diet of the Sepik people, is cultivated on a regular basis to obtain flour which is used to make pancakes and a pudding served with steamed fish and greens. The fibre of the trunk is ponded, washed with the starch being gathered once it settles in the bottom of a collection canoe. After numerous photos of the village mascot, Chris the Cassowary, and a light morning tea of fruit and slices served onboard the Zodiacs, we headed to the welcome site of Kopar, a village of stilt houses stretching along muddy banks at the entry into the Sepik River. The birders recorded Little, Whiskered, and Common Terns feeding offshore and all along the section of river we covered. A wide variety of pigeons and parrots were commuting in the early morning and we saw many Eclectus and Red-cheeked Parrots, Sulphur-crested Cockatoos and lesser numbers of Coconut Lorikeets and Black-capped Lories. Among the doves and pigeons we found Pinon's Imperial Pigeons and Orange-bellied Fruit Doves perched and Orange-fronted Fruit Doves flying over along with the occasional Torresian and one Collared Imperial Pigeons. Herons and egrets were present in good numbers with Little and Great Egrets both numerous, while Pied Herons flew past. One of the highlights this morning was good views of two Great-billed Herons, one flushing quite close and we were able to appreciate the enormous size of this uncommon heron. Before we returned to the village, we added Brahminy, Black, and Whistling Kites to the raptor tally that included several White-bellied Sea Eagles seen earlier, including excellent perched and flight views of this magnificent raptor. We entered Kopar Village in the form of a congo line, to rhythmic tribal sounds played by our welcoming party on kundu (hour-glassed) drums. Later, word was passed round that the community was surprised and excited to see that ‘white man can dance’. After welcome speeches from elected ward councilor Kelly, the official proceedings started with the national anthem, sung by the local school children. The arena opened up to a number of dance groups starting with a spectacular tumbuna (time before white man) sing sing complete with a masala spirit mask that resembled the head of a dragon and the long body of a crocodile, held high by local men. The next group from Maprik showcased their agility and musical ability to perform a colourful welcome dance. The finale of the proceedings was a short pantomime, depicting a man and women gardening, when the women died during child birth and then returned as a masala spirit to haunt the husband. 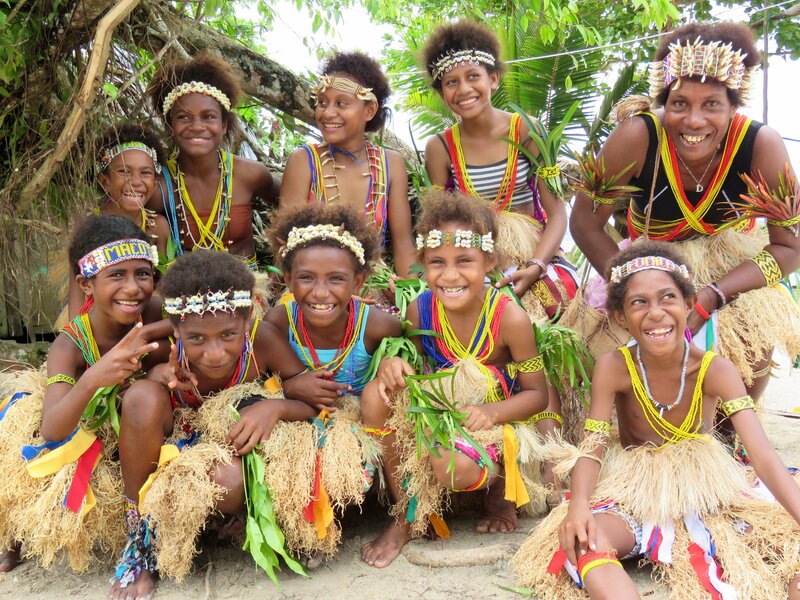 Oral history plays an important role in Melanesia as it delivers ancestor stories, myths, legends and folklore. Whilst the particular meaning of this pantomime was a mystery and a bit confusing to us all, it was certainly entertaining for both visitors and locals alike. We were soon let loose to explore the village, some of us to enjoy energetic artefact buying, others to connect with the locals to learn more about their life in this remote area of the East Sepik Province. 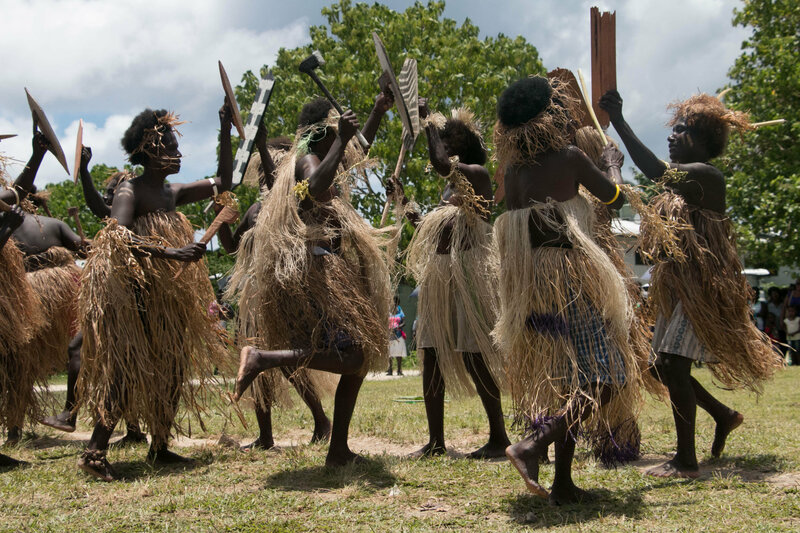 Back onboard, after lunch, our inaugural presentation was about ‘Rites of Passage – initiation ceremonies of the Sepik’ by our regional cultural specialist, Suzanne Noakes. For those intending to snorkel on the trip, we joined our marine biologist Courtney Rayes for a compulsory snorkel briefing and gathered up our fins and snorkels for the remainder of the trip. During the afternoon en-route to Manus, those top deck enjoyed the first taste of pelagic birding which Melanesia has to offer with many Wedge-tailed Shearwaters, close Bulwer's Petrels, three Tahiti Petrels sitting on the water, and most excitingly of all, a distant Beck's Petrel. Even before we arrived on the island we were certain that our time on Bipi would be special given the number of canoes that greeted us. Children of all ages circled the Spirit of Enderby in dugout canoes equipped with kayak paddles - quite unique to this region. We had been told the evening prior at recap that the new style paddles were influenced by the World Kayaking Championships held at Bipi some years back. Before stepping ashore the birders noted large numbers of Black Noddies and once anchored we observed a single Island Imperial Pigeon. An enthusiastic welcoming committee greeted us on Pelendraou Beach and whisked us away to the dance arena near the Catholic Church, under the shade of a large beach almond tree. Maxicol, our MC for the sing sing (welcome dance procession) proceedings, was soon welcoming both our expedition team and passengers alike with colourful flower lays, encouraging all of us to join the dance troop. Surrounded by more than seventeen atolls and islands, belonging to the Bipi Island Resource owners, this was truly the epitome of an island escape. Given the staple diet is sago and fish which they trade commercially for money to spend on fuel, schooling and medical supplies for the village we could understand their new-found desire to welcome tourists to their doorstep. We soon adopted a local, and were off to wander the frangipani lined boulevard on the Cross Island Road. Joining local guides birding enthusiasts walked across the island where we found several Bismarck Black Myzomelas and eventually three Island Monarchs alongside a pair of Variable Goshawks that flew back and forth on the small island. On return to the Spirit of Enderby the dugout canoe flotilla had amassed to what felt like hundreds, each jostling for space to exhibit their agile marine skills. Most spent more time bailing out the canoe rather than paddling the vessel. After the amazing welcome from Bipi Island in the morning, snorkeling was the perfect way to end a special visit with such wonderful people. All the children swam out to the coral reef slope to join us, taking great pleasure in launching into the water in every style of somersault imaginable. Beneath the surface stony and soft corals spread across the reef and we enjoyed the fish life weaving amongst it. Of special mention were the large plate corals and numerous feather stars sprinkled across the reef. Late afternoon we enjoyed an informal talk by our guest presenter, Tim Flannery in the Globe Bar for an introduction and discussion about the biological diversity and evolutionary history of Melanesia. After dinner we joined Suzanne in the Lecture Room for the first of a series of documentary movies that would be featured over the remainder of the voyage from the BBC South Pacific series to WWII and the Lost Fleet of Guadalcanal. With several endemics on the target list birders left the ship early and arrived on the shores of remote Manus Island just at dawn. We quickly boarded our van and drove out of Lorengau along a gravel road climbing towards the forested ridges of Rossun Village. Once we left the vehicle and started our walk along this quiet backroad the birds appeared right on cue. Manus Cicadabird was the first endemic species in the scope nearly simultaneously followed by two Manus Friarbirds, a large and distinctive species that called throughout the morning. A small, yellow bird on a wire turned out to be a Bismarck White-eye rather than one of the ubiquitous Olive-backed Sunbirds and soon we had two or three of these distinctive white-eyes flying all around us. A bit further, the forest edge held a pair of sharp Manus Monarchs alongside yet another Manus Cicadabird. A distant tree held several of the widespread Island Imperial Pigeons. We heard the high pitched calls of Meek's Pygmy Parrots and after some maneuvering and waiting were able to get close flight views and brief perched views. A calling Bismarck Whistler flew back and forth across the road twice. A decision was made for us to climb into the valley below the road in search of the super rare Superb Pitta and we made a long loop through beautiful forest, crossing a cool and clear rain forest stream along the way. While the pitta was absent, we did find a Nicobar Pigeon, which was nicely scoped and came across a Manus Dwarf Kingfisher. We were all a bit tired when we reached the main road again, but happy to have given the pitta our best efforts. The remainder of the expedition team headed ashore after breakfast and were soon bundled into local mini-vans and headed along the coast, stopping on a connecting bridge at Los Negros Island to watch local villagers load into public motor vehicles heading towards the markets downtown, baskets full of freshly caught crabs and bundles of vegetables. Arriving into the scenic seaside village of Lonui, we were welcomed by Dr Lawes, our master of ceremonies during our visit. After a small group of school children in traditional dress greeted us, we were soon tasting local specialties and traditional food like taro, sago and pandanus pudding, steamed greens, delicate steamed fish and a surprise dish of boiled clams. Our time onshore ended with a visit to the food market where we caught up with our newly made friends that we met earlier in the day, selling their wares. A number of new infrastructure, roads and facilities have been completed in the last few years which form part of the AusAid package for a refugee centre located on the island, which forms part of the Australian Pacific solution to clear illegal asylum seekers. However, a recent Papua New Guinea court appeal advised the refugee centre was illegal and did not comply with Papua New Guinea’s constitution and will soon be closed, noting asylum seekers would need to be moved on or returned to their homeland. Todays snorkeling site expanded out from the corner of the stunning Hawei Island situated across expansive seagrass beds and coral fringes, allowing for the enjoyment of two significant marine ecosystems in one go. Many spent time searching the seagrass for seahorses, enjoying the numerous other invertebrates along the way. Sea cucumbers, chocolate chip starfish and blue sea stars were all plentiful amongst the seagrass. Across on the reef dascyllus species swarmed around stony coral heads and a variety of fish cruised by on the reef flats. A large tree trunk provided an unusual habitat on top of the reef, with several surgeon fish and breams sheltering under the trunk as we swam past. Relaxed and easy – Hawei Island was a great site, with the splendid weather adding to the snorkeling experience. Late afternoon we joined Courtenay in the Lecture Room for a presentation on ‘Tropical Fish Identification’ before our regular recap in the Globe Bar. We disembarked right after the ship anchored and headed via Zodiacs towards our landing point on Mussau Island, one of the most remote islands we would visit during the cruise. After meeting our local guide and getting a short introduction, we headed up the road passed gardens towards taller forest hoping to find some of the island's endemics, some of which have been seen by very few birders. First we found a pair of singing Island Leaf Warblers, here the matthiae ssp. with bright yellow underparts. Three cooperative Blue-faced Parrotfinches in the middle of the path were soon in the scope and the group enjoyed the intense blues, reds, and greens of these colorful finches. In a patch of taller forest we found the first White-breasted or Mussau Monarch, a strikingly colored endemic. We walked back and forth along the road through good forest and eventually tracked down a small group of Meek's Pygmy Parrots that foraged unconcerned right next to the road. A Yellow-bibbed Fruit Dove showed briefly while Island Imperial Pigeons were more obliging. Closer to shore we found our first Whimbrel and Gray-tailed Tattlers of the trip and briefly saw a Pacific Reef-Heron being chased by an aggressive Willie Wagtail! The cool relief of a small waterfall and swimming hole awaited us at the end of the walk. Home to a large boarding school, the head teacher advised that students were sitting their end of year exams which would entitle them to continue their schooling onto year 11 and 12. Scoring some more stunning weather, we spend the afternoon on the idyllic Little Mussau Island to enjoy an afternoon of snorkeling, made even better by a beach barbeque lunch. The landowner, Margaret along with her family, welcomed us to enjoy this slice of paradise. Some said the quintessential island escape. The recent fish presentation saw everyone scouting around to identify different groups of fish and sharing their excitement with those close by. 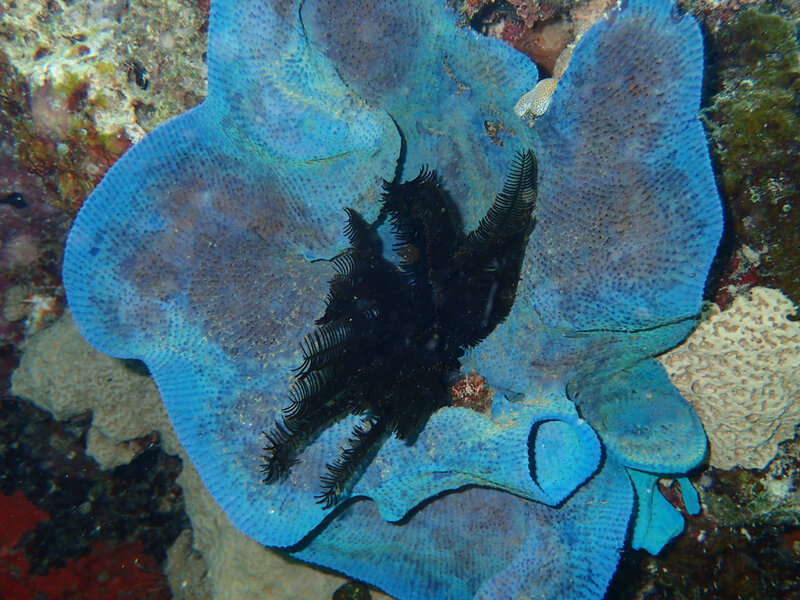 Vertically swimming hinged shrimpfish stuck out above coral heads drawing lots of attention, and giant clams were tucked into corals all over the reef. Christmas tree worms also captured great interest with their vibrant colours and quick retraction in response to movement. The site delivered plenty of options from reef flats, slopes, and a sandy beach, which entertained everyone for the whole afternoon. This would be the earliest start of the trip for the birding enthusiasts departing the ship by 02:40am! Soon we were standing on the gangway under clear, starry skies ready to head via Zodiac to Kavieng, New Ireland. Without spending too much time we boarded the open, four-wheel drive truck and whisked down the highway towards the Lelet Plateau. It took nearly three hours to reach the Limbin Road, but we arrived right at dawn and three White-necked Coucals flushing from the roadside vegetation caused our first impromptu stop. The early morning hours proved quite busy with Red-chinned, Red-flanked, and Coconut Lorikeets screeching overhead and the large and distinctive Red-knobbed Imperial Pigeon sitting atop distant trees. This forested corner also held the first endemics, including spectacular Ribbon-tailed or Paradise Drongos and oddly shaped Bismarck Crows. A pair of cooperative Long-tailed Mynas came very close, showing off their bright yellow faces and vocal abilities. We drove higher up along the road and the next stop held a small flock of the endemic Bismarck or White-backed Woodswallow with up to eight birds squeezed onto a single branch. A careful scan of the forested ridge in the distance held Knob-billed Fruit-Doves while Bismarck or Black Imperial Pigeon was seen only briefly. Singing or Song Parrots eventually revealed themselves, perching up nicely in the scope. We moved further up the road to an area of tall forest on both sides and immediately found Golden Monarchs, a showy species glowing in the canopy, and we lured in the endemic Red-banded Flowerpecker that came very close. Several flowering trees held half-dozen Red Myzomelas. At our last stop we called in a Finch's Pygmy-Parrot and the inquisitive bird nearly landed on top of one of us before altering its course for a nearby branch and offering unparalleled views of this diminutive Psittacid. A quick stop at the airport en route produced great views of the endemic Hunstein's Manakin along with the only Australian Reed Warbler of the trip. For the remaining passengers we welcomed a change in pace, diving into the days snorkeling first thing in the morning. 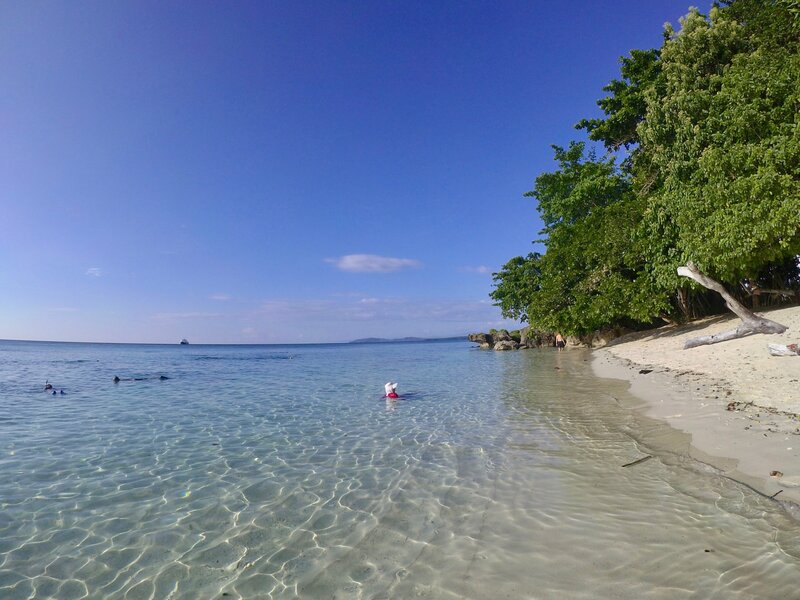 The site led straight off a small sandy beach on Nusuam Island, Kavieng, and around the corner to where the reef wall met the reef plateau. Schooling needlefish cruised by in mid-water, while schools of small fish danced around the snorkelers at the surface. Blue streak cleaner wrasse were busy at their stations distributed across the reef and anemones hosted a variety of anemone fish including pink and red and black. A few people were also fortunate to spot a blue spotted ribbon tail ray resting beneath some reef outcrops. Meanwhile several people enjoyed a nature walk on the island, with Tim pointing out the fossilized corals scattered across the intertidal zone rock and abundance of cowries in the shallow rock pools. After lunch onboard, we were shuttled ashore for an orientation visit of Kavieng, the provincial centre for New Ireland. First stop was the Tree House. A unique house built by a New Zealander expat, within the limbs of a large shade tree, served as scenic arena for a tumbuan (spirit) welcome dance. Soon we were off along the Boluminski highway to visit Maiom Village and the large crystal cave – the source of the local village’s fresh water and creation stories. Traditional taboos are strictly adhered to when visiting this site, even to this day no one is allowed to swim in the cool water at the base of the caves or vandalise any part of the interior. During WWII the Japanese Admiral Tamura used the cave as his sanctuary – chronicled in war crimes journals he was responsible for executing 23 Europeans at the Kavieng Wharf massacre, prior to the end of WWII. Being the inaugural opening of the craft market, we were invited to join the festivities – a chance to purchase hand-crafted artefacts and view a sacred women’s dance – Kuleptaina, normally preformed at the end of Malagan “festival of the dead" ceremony. After refreshments of fruit and freshly picked coconuts we were soon on our way to Bagail Cemetery where we learnt about the early German colonial history and stories of Bolumirski, the administrator of the time who was responsible for many of the key infrastructure still in play today including the road that circles the island. Back on board, late afternoon, we join Suzanne in the Lecture Room for a presentation on Mortuary Rituals in Melanesia – from the bizarre to current ceremonies, including the New Ireland Malagan ceremony. Heading out in the early evening we enjoyed a spectacle of hundreds of Black Noddies streaming past the ship and two concrete channel markers held a dozen Brown Boobies. Just before a perfect sunset, Lesser Frigatebirds circled lazily above the ship and a dozen high flying Nicobar Pigeons were spotted commuting between islands. Situated precariously surrounded by a number of beautiful cone-shaped volcanoes (Tovanumbatir, Kombiu, Turagunan, Tavurvur, Vulcan), Rabaul is perched on the edge of a dramatic flooded-caldera harbour. In 1994 this was the site of an enormous volcanic eruption by Tavurvur and Vulcan Volcanoes that leveled most of the former capital of New Britain, Rabaul Township, leaving in its wake tons of volcanic ash, which to this day is still being excavated. Although the thriving new settlement of Kokopo is supposed to replace Rabaul and provide a much safer locale for development on the Gazelle Peninsula, the pull of the old harbour remains strong, and rebuilding is sneaking back into the ruined town, once the jewel of the southwestern Pacific. 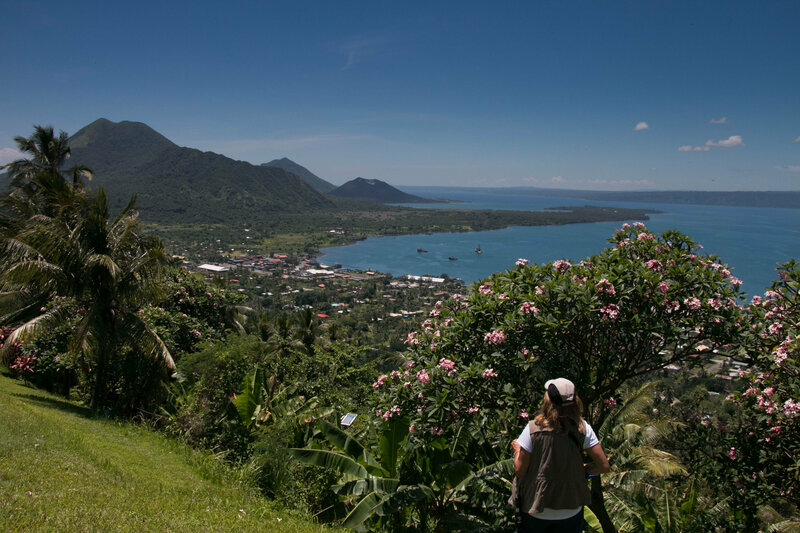 Situated on New Britain Island, Rabaul was a thriving capital of German New Guinea in the late 1800s, and then later placed under Australian control by a League of Nations mandate following WWI. After the Japanese invasion in WWII, the island became an important and impregnable base, laced with over 500kms of tunnels into the hills – a honeycomb of interconnecting passages and bunkers, with over 97,000 Japanese troops and thousands of POWs. Allied bombing raids were incessant towards the end of the war, and the town was flattened, with over 40 ships sunk in the harbour. Landing at Kokopo in the early morning the birding group boarded two Land Rovers for the long drive to the Wild Dog Mine road. During a brief stop en-route we added our first New Britain endemics to the list, the large New Britain Friarbird and an Ashy Myzomela that zipped across the road. After arriving at the start of the road, more of a track really, up towards the mine we started to hike uphill. The morning warmed up quickly, but we managed to find several great birds, including additional New Britain endemics in the form of perched Blue-eyed Cockatoo seen well in the scope and a brief male Black-bellied Myzomela. In addition, Red-chinned Lorikeets and Purple-bellied Lories flew over while the ever-present Brahminy Kites circled above. During the return trip we made another brief stop and scoped a pair of Moustached Treeswifts and discovered a roosting Bismarck Flying Fox. The short grass near the landing site held our first Pacific Golden-Plover of the trip and as the Zodiac approached the ship during our return a Black Noddy offered several close views. A beautiful calm morning welcomed the remainder of the group as we headed ashore and bundled into our minivans ready to explore Kokopo and Rabaul starting first at the Kokopo Museum. The grounds surrounding the museum are littered with World War II relics including jeeps, both allied and Japanese planes along with numerous shells, guns and memorabilia with the showrooms providing an insight to the early European history of the Germans, Queen Emma and journals from WWII veterans. The resident historian Michael Lassick, third generation Tolai, introduced the complex to us. A cultural house-wind was a real find storing a mass of Baining dance masks – certainly a collector’s trove. After stopping at the Japanese barge tunnels, we continue on to the old town of Rabaul to visit the volcano observatory and monitoring station, Yamamoto’s bunker, New Guinea club ending up close and personal near Tavurvur Volcano. At the Observatory we had the chance to take in the full impact of the caldera that lay below us along with the surrounding dormant and active volcanoes that test the mood of the town on a daily basis. Mr Killa, the resident volcanologist, gave an informative overview of the current state of play in regards to volcanic movements and monitoring stations. This afternoon, amongst the Duke of York Islands we found a unique snorkeling site on a gradual reef flat extending out from an isolated island. The island was inhabited by a single family who were kind enough to let us enjoy all there was to offer on their little slice of paradise. The reef flat consisted of patches of coral and so much more in between. It appeared to be a great nursery ground for many species including anemonefish, lionfish and spiny lobsters. Scuttling across the bottom before slipping under some coral was a peacock mantis shrimp, and echinoderms were abundant. For those who took a closer look at the anemones, numerous commensal shrimp were also present. The beach was a treat to explore and the water could not have been a better shade of blue, making the swimming and snorkeling exceptional. Late afternoon we join Naturalist Dan Brown in the Lecture Room for his presentation ‘Introduction to Whale and Dolphin identification’. A tropical atoll lifting out of the azure waters of Buka Channel, Nissan (Green) Island is bathed in rich tropical currents that abound in marine life. Seldom have outsiders had the opportunity to discover this island, infact it appears the only expedition ship to grace its shores in the past few years was the Spirit of Enderby last October along with our return this year. 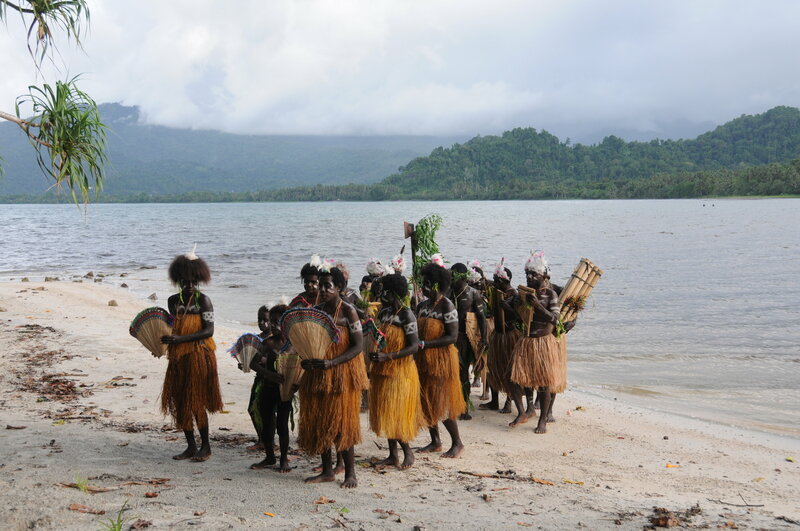 Soon we were lined up on ‘Balil I’ Beach to be cleansed of evil spirits by the chiefs as they sprinkle sacred spring water on our heads before we step across an imaginary threshold into the village. On entry it felt like the whole population of the island, some 5,000 strong were there to greet us. Many remembering the staff from last years visit. As honoured guests we were lead in a procession weaving our way through the excited villages to an undercover area within the school grounds. After a welcome from the elected administrator Silvia, and head mistress Flora, we were soon entertained by a number of spear, fishing and butterfly dancers – all combining myth and legend into the story line. Later during our exploration of the island with our newly adopted friends, some of the elder villages shared stories about how the island was a base for both American and New Zealand troops during WWII. In fact, the island was visited by Lt Richard Nixon (later on he became the President of the United States of America). A number of the villagers we spoke to were concerned about climate change, and we soon learned that an NGO (Non Government Organisation), CARE International had been working extensively with the island community to develop alternative food sources along with sustainable fishing and population levels. Just prior to departing the island heavy rain drove us reluctantly back to the comfort of the ship. After welcome dances and ceremonies the birders headed out into the forest of this small, but beautifully green island. It did not take long until they found the first active flock of Louisiana White-eye and we tallied at least two dozen of this distinct species before the end of the day. Then it started to drizzle, then rain, and then just pour buckets, but we hung in there and found a fruiting tree that was briefly visited by an Atoll Starling among Metallic Starlings. Our planned afternoon of snorkeling was cancelled due to an unexpected severe weather front that brought both high winds and seas, making it uncomfortable and unsafe to venture into the water. Instead we continued our voyage towards Bougainville in the hope to find calmer seas and finer weather. The remainder of the afternoon presentations and recap was postponed to ensure all was kept safe in the cocoon of our cabins. Those willing to venture up on deck and face the rough seas were rewarded with sightings of several Red-footed Boobies and the first White-tailed Tropicbird of the trip. We are amongst the very few who have explored the Autonomous Region of Bougainville in the last few years, given until the late 1990s entry was closed to visitation due to the internal conflict which raged over 10 years (1984-1994). The conflict was brought on by tensions of self-determination, disputes over indigenous control of land and inequality of profit distribution from the copper mine established on Bougainville in 1963. Early this morning we rejoice in the chance to explore the immense biodiversity of the island. Climbing up into the forested mountains reaching an elevation of 950 metres this afforded us a spectacular view of a distant active volcano projecting flumes of smoke into the atmosphere. Some deviated from the planned excursion to Panguna mine to try their luck birding and to track down the endemic species of the island. 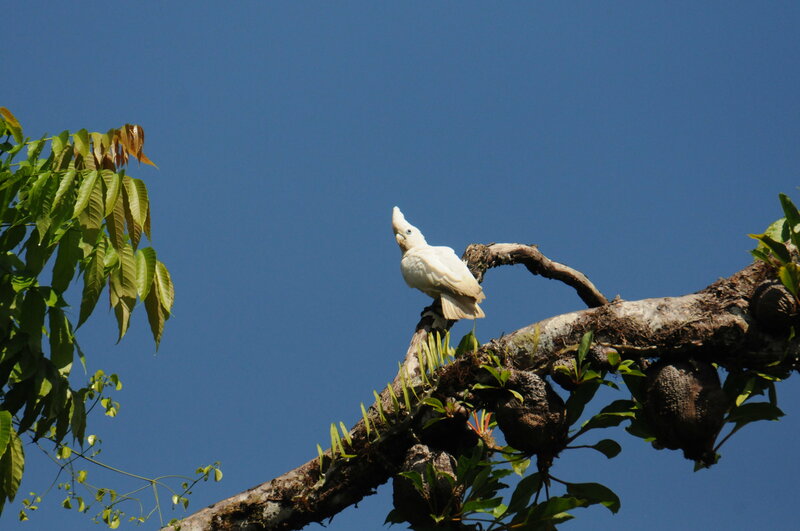 In fact, before we even left the wharf we already added the first Solomon Island endemic in the form of several Solomon or Ducorp's Cockatoos on a distant ridge alongside a group of Blyth's Hornbills. After a 45-minute drive, we reached the top of the road where we left the remainder of the group. We started our walk back down the road and immediately bumped into new birds. An active flock of Yellow-throated White-eyes passed through, while a male Steel-blue Flycatcher called nearby and showed well. Midget Flowerpeckers were fairly common with fewer Red-capped Myzomelas also seen as well. Bougainville Crows calling on a distant ridge got our attention and soon enough we had one, two, then three fly right over us and perch in view. We walked further along the road and carefully scrutinized each feeding flock and finally found several Oriole Whistlers and two Solomon's Monarchs plus Gray-throated White-eyes that showed briefly. At the last stop a spritely Rufous Fantail came close, allowing everyone to get good views of this distinctively marked species. Yet, the morning was not over and one of the birding highlights of the trip came during the drive back towards the wharf when a Woodford's Rail appeared on the side of the road. A quick stop and scramble from the van and with some maneuvering the whole group were able to have brief, but good views. The rest of us continued towards the Bougainville Copper mine site, now lying derelict deep in the mountains, a visible scar on the landscape and within the hearts of the local guides and landowners we meet along the way. We enjoy an excellent study tour of the mine site visiting the main pit, standing atop the massive tailings canal and deserted workers apartments, now shells that house local villages whose homes were destroyed in the conflict. In its day the mine was the largest open cut copper mine in the world. Now a major scrap site, companies and countries alike bid for annual contracts to remove large amounts of metal contributing to the cash crop of the island. 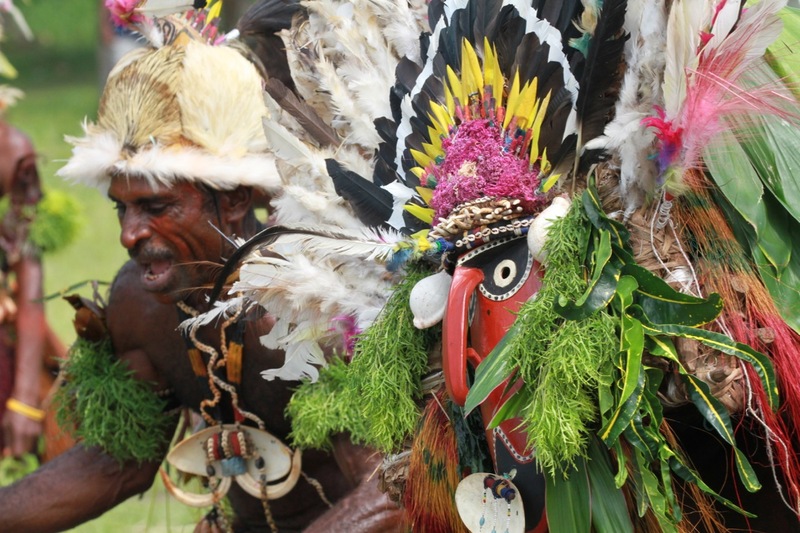 Bougainville people associate more with Solomon Islands people than Papua New Guinea, giving rise to a referendum due to be held in the next coming years on whether to secede from Papua New Guinea or stay as an Autonomous Region. Returning in the afternoon we visited the Awara craft and vegetable market and were treated to farewell dances under the shade of large shore side trees. Adding the Sanford's Sea-Eagle, Cardinal Lory, and a pair of Brown-winged Starling right as we were leaving. Back on board we joined Tim Flannery for his informal presentation on ‘Searching for Mammals in the New Guinea Highlands’. At recap two guest presenters, Brian and Chris, delved deeper into the mines history along with the process of extraction. After dinner a guest presenter, Clare Ashton, gave an overview of Australian Nursing Sisters in German New Guinea & the First World War. Once custom officers completed our clearance into the Solomon Islands we started our planned program for the day. We were in for a special treat this morning as we joined our expedition team on a Zodiac journey into the mangrove canals of Choiseul Island along the Sui River, ending at the picturesque Sui waterfall. At each turn the undergrowth evolved – first we learned about the complexities of the mangroves, and then experienced the dense rainforest as it spilled out over the low sedimentary shoreline. It was a productive birding cruise through the mangroves and lowland rain forest. A Beach Kingfisher welcomed us at the mouth of the river and we would add a pair of endemic Ultramarine Kingfishers and a Little Kingfisher through the day. Solomon or Ducorp's Cockatoos were numerous overhead and Cardinal Lories showed well several times. Moustached Treeswifts also offered some of the best views of the trip yet. We stopped underneath a fruiting tree and finally everyone had great views of the stunning Claret-beasted Fruit Dove. A flock a smaller species held the first Chestnut-bellied Monarch of the trip alongside Red-capped Myzomelas and Yellow-throated White-eyes. Two Whimbrels and Common Sandpipers were reminders that shorebirds had vacated their breeding grounds to the north and were migrating south. A Sanford's Sea Eagle that sailed across finished a very enjoyable and productive morning. The more adventurous of the group took up the option of an off-the-beaten track walk with the hope of ending at the top of the waterfall. Due to the track being overgrown, sabotaged with nasty biting ants, and very muddy from the storm the night prior, the group elected to retrace their steps to the water’s edge. Whilst the track defeated them they were in good spirits – all congratulating themselves for surviving the challenge. Weaving our way out of the isolated waterways, we were invited onshore at Taro, the small provincial capital of this area. Our official welcome included speeches from the Solomon Island Tourism Authority, the local member, along with a number of dancers from both the Melanesian and Micronesian inhabitants. Sitting in the shade of the newly built arrival shed, sipping on freshly collected coconuts and savouring sweet juicy pineapple, we certainly felt like honoured guests. Once the official part of the program was completed Suzanne had added a surprise dance number to the proceedings which included all passengers doing the ‘hokey pokey’ – to the absolute delight of the Taro residences. Good fortune once again presented itself on our visit as the women of Choiseul were celebrating a week-long festival, with many artefact stalls on show, allowing us the unique opportunity to shop as well as admire the local handicrafts from this region. Following lunch, a coral reef stretching from the end of Taro Village to a small round island provided a great snorkeling site to bring our time in Choiseul to an end. The reef wall and expansive flats had a great display of colourful hard and soft corals, and an abundance of fish life cruising in the current. There were anemones galore extending right across the site. Parrotfish were abundant on the drop off rasping at algae on coral, while schools of indo-pacific sergeant fish and convict tangs stood out in the water column. One keen eyed snorkeller also enjoyed the presence of a nudibranch hidden on the reef. The only downfall was being limited by time and having to return to the ship for departure. Some took up the option to lay-back and soak up the island paradise beach-side at Supizae Village, opposite Taro township. Late afternoon we joined Stephan in the Lecture Room for his presentation on the ‘Endemic Birds of the Solomon Islands’. The sight of one of the highest points in the Solomon Islands archipelago greeted as we stepped out on the deck this morning to view the extinct cone volcano of Kolombonagara. We had been invited by KIBCA (Kolombangara Island Biodiversity Conservation Association), to visit the conservation area 400 metres above the sustainable forest plantation. On arrival onshore we boarded the ‘best available transport’ – two ten-ton trucks complete with slabs of wood in the back for seats, to begin our scenic drive to the ranger buildings within the conservation area. The gravel road left the coast and headed towards the two distant volcanoes, steadily rising in elevation. After fifteen minutes, we left the forest plantation behind and entered vivid green sub-montane forest. Ending at the research station we enjoyed the pleasant cool temperatures with some of us setting up on the porch overlooking the valley beyond. Pale Mountain-Pigeons flew in within a few minutes and offered excellent views in the scope. A distant ridge held Knob-billed Imperial Pigeon and Claret-breasted Fruit Dove. Ducorp's Cockatoos and Cardinal Lories were common all morning, while Buff-headed Coucal was heard only. Solomon's White-eyes passed through in small flocks, while fidgety Crimson-rumped Myzomelas stayed higher in the canopy. Fortunately, the stunning White-capped Monarch proved to be quite common and one individual offered lengthy scope studies. A small feeding flock held the only Cockerell's Fantail of the morning, which sat still long enough for everyone to get a view. A Stephan's Dove foraged in the middle of the road, allowing everyone to have excellent views if they missed it earlier during the trip. The remainder of the group enjoyed a nature walk into the thick rainforest, uncovering many unique insects and plants camouflaged to co-habitat in the lush undergrowth. Covering an area of over 20,000 hectares (200sq km), the conversation equates to approximately 28% of the island, making it the largest conservation area in the Solomon Islands. On the island both locals and the conservation groups are dedicated to maintain wildlife corridors along with marine protection areas. On return to the landing site we were tempted by exquisite contemporary pieces of polished wood from bowls to elaborate masks from Rinaggi and Boboe village carvers – eager to sell their wares the local carvers were in agreement to take US dollars as well as the local Solomon Islands currency. Extending their trading hours – some even followed us back to the Spirit of Enderby in their banana fiberglass boats to try and squeeze some extra dollars out of us. Sailing through what was called ‘The Slot/Tokyo Express’ during WWII where the Japanese would transport cargo ships late in the evening, Suzanne aired the first part of the National Geographic’s search for ‘The Lost Fleet of Guadalcanal’ – an informative whilst solemn introduction to WWII in this area. Part two to be shown the following day, in readiness for our arrival into Guadalcanal. Thanks to the wonderful Rocky from Boboe Village we got to explore a brilliant new snorkel site moments away from the village in the afternoon. Across the water from Kolombangara and sheltered between smaller islands were numerous stretches of hard coral reefs covered in a variety of marine life. The site we chose had a shallow reef flat making viewing of marine life very easy, and sloped off on each side into deeper channels. We were inundated with new encounters for the trip including swollen phyllidia nudibranchs, barrel sponges, shoals of squid, blacktip reef sharks, seafans and trevallies. Featherstars, schooling fish, anemones, sea cucumbers, clams, christmas tree and feather duster worms were also very abundant. Once again local children paddled out in canoes to join in the excitement, enhancing the overall experience. Early evening, we forgo recap and joined Tim Flannery in the Lecture Room for an introduction to endemic bat species that can be found in this area. 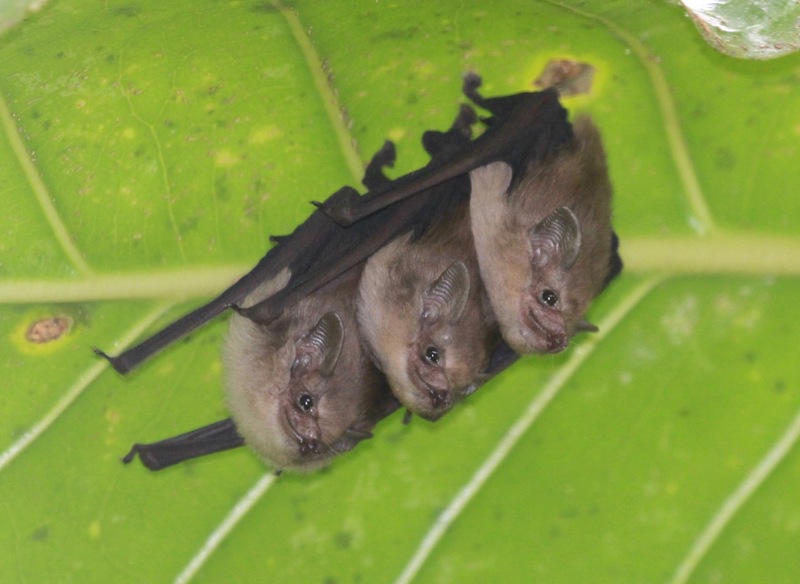 Soon we were plying the waterways on a sunset Zodiac cruise in the hope to track down these bats in their habitat along the shoreline feeding trees at Boboe Village. Jollied by the excursion we returned to the Spirit of Enderby for a well-earned dinner, ending a truly magnificent day of exploring the natural wonders of this island. In line with the informative content of our voyage this morning we were privileged to visit the Arnavon turtle conservation area. Keeping up with our tradition of visiting areas that seldom see tourists or other cruising vessels we were delighted to have the chance for an informative and interesting tour of the turtle conservation area. Francis, welcomed us and thanked us for visiting. Lesley Nike highlighted the importance of our visit which contributed to the conservation efforts of key biological sites. He went onto brief us about the conservation area, what duties the resident rangers perform and the challenges they face based on changing weather systems and human encroachment. 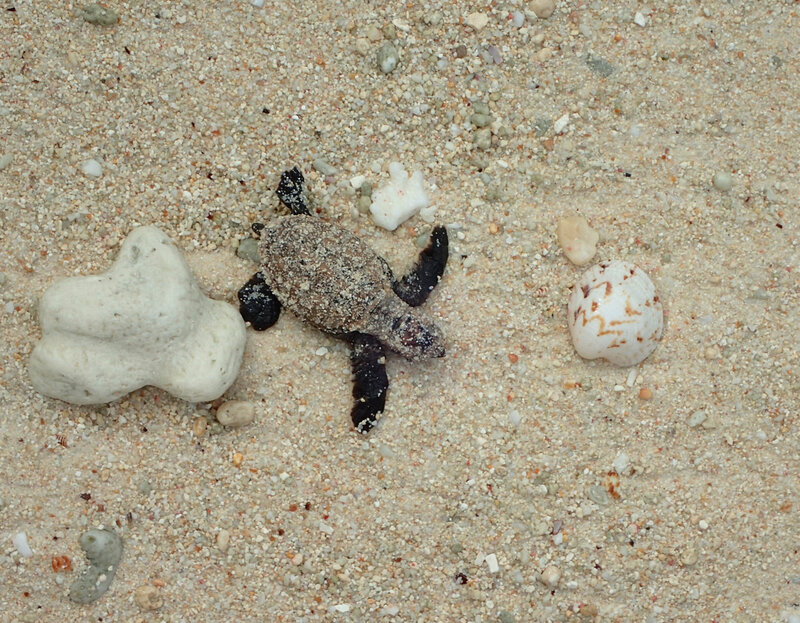 The island serves as a primarily hatching island for the hawksbill turtles but also occasionally sees green and leatherback turtles venturing into its waters. After a few welcome dancers, we had the pleasure of witnessing two clutches of hatchlings, each with approx. 150 turtles in each, which made a dash to the water’s edge, past the watchful paparazzi, where they had their ‘first contact’ with surf, and frantically swam into the deep blue to begin their lives. A few too shy to make the plunge hide under rock and crevices, later to be released by rangers. We wished them good luck, given their slim change of 1-1,000 survival rating and hopeful to see them back here in 25 years when they return to mate and lay their first eggs. Birders extended their stay to enjoy the best chance for shorebirds during the trip and were not disappointed. Greater and Lesser Sand-Plovers offered excellent comparisons, Pacific Golden-Plover proved common with 2-3 Black-bellied Plovers mixed in. Both Gray-tailed and Wandering Tattlers made their presence known with their distinctive calls and Common Sandpipers were, well, common. A few Bar-tailed Godwits patrolled the drier sand, while a flock of locally rare Black-tailed Godwits waded in deeper water along the edge of the mangroves. We also discovered a hyper-active Terek's Sandpiper among the more sedate Curlew and Sharp-tailed Sandpipers. Other new birds of the trip included Nankeen Night-Heron and Australasian Swamphen, while a regal Sanford's Sea Eagle was scoped nicely. Before heading back to the ship we tracked down a Melanesian Megapode for scope views. At sea we recorded good numbers of noddies, boobies, and the first White Tern of the trip. The Arnavon Islands were not only a great place to appreciate the turtle conservation project and bird life, but had beautiful reef surroundings as well. Starting on an isolated beach we ventured out onto the coral flats prior to moving across to a blue oval surrounded by stands of staghorn coral and coral boulders. A couple of blacktip reef sharks were seen darting off into the distance and many schools of fish swarmed between the corals. These included an array of damsels, surgeonfish, bream, goatfish, oriental and dotted sweetlips and a very well camouflaged flounder attempting to evade attention. On the sand oval, shrimpgobies were abundant with their snapping shrimps busy bulldozing the entrance ways to the extensive tunnels below. Amid the reef, giant clams were nestled into coral and an assortment of anemone fish was present. It was a great way to finish snorkeling for the trip and added to a very memorable morning! With a sense of experiencing something truly remarkable we left the Arnavon Islands filled with gratification of witnessing a special event, we were soon cruising the endless blue bound for Honiara and the end of our Melanesia Discoverer Expedition. Early evening, we join the expedition team for our final recap and to review the photo log of this remarkable trip. Surely a trip of lifetime. Early morning, we anchor in the harbour off Honiara, on the northern coast of Guadalcanal, by the Mataniko River. Honiara was a military base during World War II and is the capital of the Solomon Islands. The Solomon Islands witnessed major naval battles in this region and some would say was the starting point of turning the tide on the Japanese invasion within the Pacific War. This morning we enjoy the opportunity of touring Honiara, visiting WWII historical sites and local sights inclusive of the markets and local museum before returning downtown to ready ourselves for our onward travel plans. We would like to thank all the Heritage staff on the Spirit of Enderby for their wonderful work to make our recent Melanesia Discoverer trip such a fantastic journey. Aaron, Helen, Courtney, Dan, Suzanne, Heather and Stefan were always friendly and helpful and made every day an interesting and stress-free adventure. Having their expertise as well as that of Tim Flannery to educate and add depth to our experiences added so much to every day. We were especially lucky that they helped us through the delay in Port Moresby and also that I was able to share an afternoon with teachers in a school on Nissan Island with Helen. I loved the mix of culture and nature on the itinerary and am very grateful that we had the chance to join this expedition to an area so close to Australia yet so unknown to us. So heartfelt thanks again to all involved in organising and staffing this trip. We cannot recommend Heritage Expeditions highly enough to our friends.
" Thank you so much! This trip opened up a different world for me. I was so impressed with your staff and your entire organization. I am recommending your tours to all my friends. 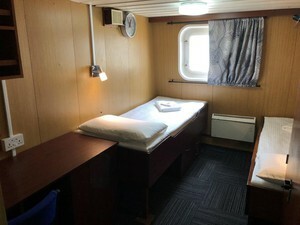 My friend has been in touch with you regarding the Jewel of the Russian Far East trip. Love the unique and off the beaten path. " " What a fantastic trip! Not only did we get to five islands way off the beaten track, never before visited by a commercial expedition boat, but the friendliness and welcome, culture, activities, birds and freedom to roam made every stop unforgettable. And the hospitality on board was superb, meeting new friends - even getting to suggest special dishes. Looking forward to travelling with you again. " " "I found the whole experience most exhilarating. I learnt a lot - met very interesting people - had great food and was well taken care of by everyone. Thank you ever so much". "